9591 Private Francis Charles Day No6 Platoon B Company 28th regiment. Francis Charles Day (of Ampney Crucis, Cirencester, Glos.) 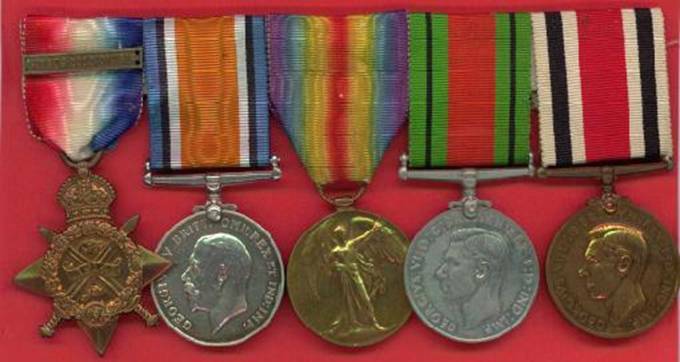 enlisted in the 1st Battalion Gloucestershire Regiment (28th) on the 3rd February 1912, aged 18 years. The Regiment was stationed at Bordon, near Aldershot. On the 12th August 1914 it embarked on the S.S. Gloucester Castle, bound for Le Havre and War. Part of the First Division, it took up a position near Landrecies. It was there on August 26th 1914, the Glosters saw their first action of the War. "The British Expeditionary Force....was a small force compared with the French and German Armies, but in quality it was superb. The spirit of the men, their fighting ability and marksmanship, and their equipment made it an incomparable little army..... The task of the B.E.F., to fight with the French and Belgians against the tremendous German Army, was one which called for gallantry and self-sacrifice. Their stubborn resistance gave Britain time to muster and equip her new armies, but the cost in the flower of Britain's manhood was tragic." LE Qd FAYT 5am. left billets with the Brigade and marched towards FAVRIL. The Bn. was advanced guard to the Brigade. on approaching FAVRIL two companies were extended in fan like formation from RUE DU BOIS - point 173 - CROIX-HAINAUT to cover the reconnaisance. The Brigade then occupied a position facing LANDRECIS. Glouc. Regt. astride the LANDRECIS Road. The Queen's in reserve at FAVRIL. The Bn. entrenched along a line of hedges covering the exits at LANDRECIS and a section of the 54th Battery RFA under Lt. Blewitt took up a position in line with our trenches near the centre. "C" Company was posted East of the road "D" Company and M.G. Section West of the road "A" Company in reserve 200 yards up the road, and "B" Company out to the front as covering party. About noon it was reported that a column was moving from E to W by a road just N of LANDRECIS. It was doubtful if the column was hostile or not owing to the difficulty of observation only the heads and shoulders of mounted men could be seen crossing small gaps. About 1pm a second column was seen following the first. Lt. Blewitt opened fire and appeared to do good practice but with what result could not be ascertained. About 40 dismounted men were seen approaching through an orchard and the guns burst two shells over them before they dispersed. A German battery then opened fire and did very good practice against our trenches. At this time an aeroplane carrying French colours came swooping down over our position only 200-300 feet up. The Germans apparently opened fire on it, but directly after the aeroplane passed from left to right along the whole of our position and immediately after the Germans got the exact range of our trenches. It was not long before "B" Company was driven in and retired round the flanks but not before suffering some casualties. Captain G.M. Shipway was mortally wounded. No 5132 Pte. Lander distinguished himself, although wounded he continued firing and is said to have accounted for 6 Germans before he was bayonetted. During the evening he was brought in by a patrol of the 12th Lancers. The trenches were subjected to very little rifle fire and by 5pm the action had come to an end. "I had a very rough time after that 26th August at Landrecies, when I was shot through both knees. I remember you (Lt. Col. R.M. Grazebrook OBE MC, then OC No 6 Platoon 'B' Coy.) tying your handkerchief around my leg before retiring. I must have passed out soon after, for it was quite dark before I knew anything about it and then could not move. I just remember seeing some of the Huns away to our right, so I think the shot must have come from there. I suppose I was one of the first men of the 28th to gat wounded. I lay out there for 3 days and wondered if I should get back home for it seemed like weeks. The only company I had was a man named Holford; he died the same night; so it did look rather hopeless and worse still when I saw all those Germans charging with fixed bayonets and an officer on a horse with revolver levelled at me. They must have thought we were 2 scouts. After wanting to know where the Regiment was he gave orders for me to be taken to Landrecies. Before I was taken to hospital I was put in a cottage 2 doors from a house they were setting on fire and I told them it would have been better to have stopped in the fields than to be burnt to death. After a few days I had tetanus, pleurisy and pneumonia. By good luck some of our 5th Field Ambulance were prisoners there and they nursed me through the worst part before they were sent to Germany. Around Christmas I was sent to Le Cateau and remained there until February 1915, when I was repatriated with the first batch of returned prisoners. I lost my left leg through paralysis on the 26th August, just 12 months after being hit. After a long spell in hospital I was finally discharged in October 1916. My right leg is not too strong now, but I am able to get around on crutches and am otherwise in very good health." A picture of Private Day from the Cheltenham Chronicle and Glo'shire Graphic of November 28th 1914. It states "Private F.C. 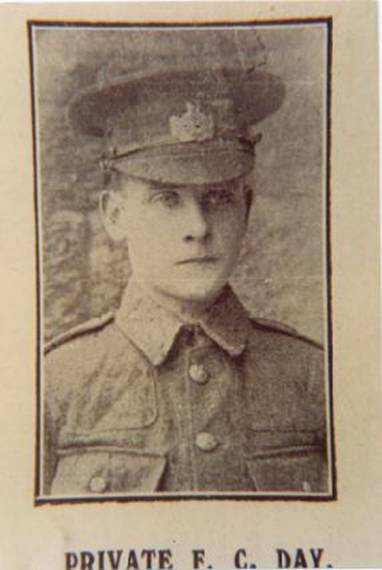 Day 1st Gloucester Regiment, of Ampney Crucis, wounded in action, and missing since August 26th. "I was therefore out alone with my platoon and was being enfiladed from my left. In consequence we had to get back, but was forced to leave behind Pte F Day, who had been wounded n the right knee. L/Cpl Hackling was at this time killed outright by a bullet through the heart. Day was captured by the enemy, as he was left hidden away behind the hedges and out of sight of the cavalry who did rescue a certain number of our fellows. He was returned the next year as an exchange prisoner of war." Among the 210 British rank and file who have been exchanged for German Prisoners on the grounds of unfitness for further service are Pte. A.Hobbs 7705, Pte. F.C.Day 9591 & Pte. F.Saunders 9665, 1st Gloucestershire Regt. 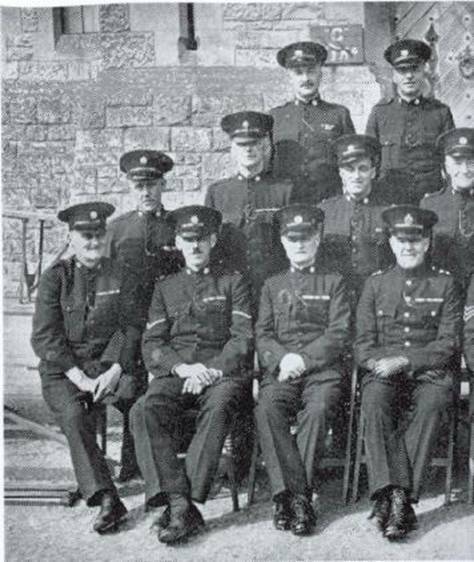 A picture of the Ampney Section, Special Constabulary, taken after the 2nd War. Francis Day is seated far left.